There are plenty of smaller software providers out there which we often overlook due to the bigger names constantly capturing our attention. One lesser-known developer is RealTime Gaming (RTG) and despite its 18 year run, we’re only now noticing the potential this provider has. This is due to the controversial issues RTG has faced in the past, which we discuss below, and as a result these games haven’t yet been added to our secure recommended casinos – but it may not be long now until we can access RTG titles at the top online casinos. RealTime Gaming was launched in Atlanta in 1998 but had to move their headquarters almost a decade later due to the implementation of restrictive online gaming laws in the USA. The provider has remained in Costa Rica ever since, developing pokies, table games and even a selection of casual games. When RTG first launched, downloadable software was the only available way to access a casino client, and this was only compatible with PCs – the majority of the market used PCs at the time. 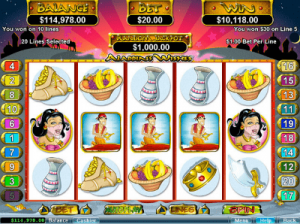 However, as Apple stole a huge portion of desktop users, Flash casinos began to be developed and RTG made an instant play version of its downloadable client available. Both the downloadable software and the browser-based platforms are still available for RTG games. In 2004, the provider came under fire when a player won $1.3 million on RTG’s table game known as Caribbean 21. The casino hosting the RTG title refused to pay, claiming the player was cheating due to winning a six figure amount at another online casino at the same time. This was disputed and an undisclosed amount was said to have been settled out of court – though there’s no documented proof of this. Another issue involved the owner of Crystal Palace – a group of RTG powered casinos – mysteriously dying on his yacht. The casinos had been under fire for not paying players or ripping players off, and the death of the 34 year old was incredibly suspicious. While this isn’t directly RTG’s fault, their open policy allowing operators to choose the RTP or payout rates for their games has been a cause for concern. While we don’t recommend any casinos offering RTG games at the time of writing, it may not be long until the provider is added to reputable online casinos. Only when the games are available at one of our trusted, top-rated casinos do we recommend playing RTG games, as they will have been tested by authorised third parties in order to pass the strict criteria required before receiving our endorsement. RTG have a substantial catalogue and despite not being available at our favourite online casinos yet, they may be soon. The games can be accessed by installing the software – but if they are added to the best casino sites then they will most likely only be available for instant-play through your web browser. Many of the games have also been optimised for mobile devices and you can play on your iPhone, Android, iPad or other tablet, as well as laptops and desktops. An important thing to remember when it comes to RTG games is the payout rates are adjusted by the operator – the developer leaves the RTP percentages to the casino vendors. This means if you aren’t playing at a secure site, you can risk losing you deposited funds to a low RTP title. While the sites we recommend, which are regulated by authoritative bodies to ensure players are protected, don’t offer RTG games you can research online to find an RTG casino, or wait until our casinos add this software provider. RTG has created hundreds of online pokies over the years but the stars of the shows are those created for their Real Series. These titles offer progressive jackpots including the minor and major jackpots. Three titles which are incredibly popular include Aladdin’s Wishes, Caesar’s Empire and Ronin. Each features 20 paylines and while they aren’t officially licensed, they still resemble the well known pop culture characters, including Jasmine and the Genie in Aladdin. The Real Series also offer 50 paylines and the progressive jackpots start at $1000 – which isn’t as high as you can find on Microgaming or NetEnt titles, but can still get quite high. 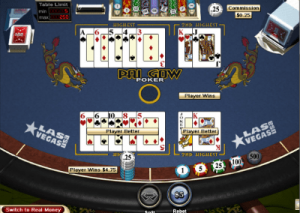 RTG offers a selection of table games with smooth and fast graphics. Table titles include roulette, blackjack, baccarat, craps, Caribbean Hold’em, and a variety of poker variants including Caribbean Stud Poker, Let’Em Ride, Pai Gow Poker, Tri Card Poker, and Vegas 3 Card Rummy. Some players have mentioned the lack of decks revealed for some table games – so take this into consideration especially when playing blackjack with the corresponding basic strategy. Similarly to Microgaming, RTG offers a selection of video poker titles and while Microgaming offers high RTPs, unfortunately RTG leaves it up to the operator’s discretion so be sure to do your research on the operator’s and their titles. 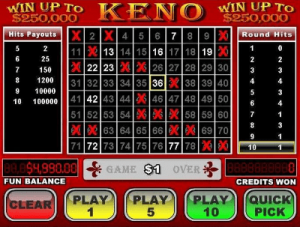 Keno is quite rare online but RTG offer a title where you can pick up to 15 numbers from 80. There’s also bingo and a selection of scratch cards too.